To order printed back issues of the first three issues of the journal, go to Parallel Press at the University of Wisconsin-Madison, USA. 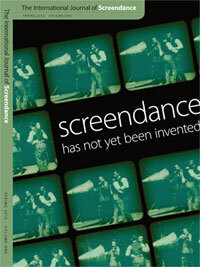 The International Journal of Screendance was originally published by Parallel Press/University of Wisconsin-Madison, USA, in collaboration with the University of Brighton, UK. It was launched at a reception hosted by the American Dance Festival on 25 June 2010. The launch coincided with ADF’s Dancing for the Camera Festival of Dance on Film and Video and a meeting of the Screendance Network. In 2014 The journal migrated to the Ohio State University, and is now published on the Open Journal System. The International Journal of Screendance is a peer-reviewed publication, the first ever scholarly journal dedicated to the growing area of the inter-disciplinary practice of Screendance. It is an initiative undertaken by an international group of practitioners, researchers, curators and activists engaged with Screendance, who wish to establish a forum for debate for all those interested in the intersection of dance and the moving image. The editorial board is constituted from members of the International Screendance Network, as well as scholars and artists from related fields of inquiry. The first three issues of the journal were funded by the Arts and Humanities Research Council (AHRC, UK), with further support from the University of Brighton (UK) and the University of Wisconsin - Madison (US). The new online journal is hosted by the Ohio State University (US). The International Journal of Screendance engages in rigorous critique grounded in both pre-existing and yet-to-be articulated methodologies from the fields of dance, performance, visual art, cinema and media arts, drawing on their practices, technologies, theories and philosophies. As an international platform for Screendance scholarship, the journal seeks to foster not only a multicultural but also a multilingual discourse. This journal is essential reading for all those interested in the intersection of dance and the moving image, including film and video-makers, dance artists, producers, composers, as well as the wider interested public. It is an invaluable resource for researchers and professionals in the field. The journal includes original scholarship and historically pertinent, yet hard-to-find writings, as well as specially commissioned articles. Each issue is edited around a particular theme and a set of questions that frame current discussions in the global field of screendance as a means of promoting and enriching dialogue within the wider community of dance and the moving image. The editorial role is rotating between members of the Editorial board.